Today I'm reviewing the World War II thriller, Five Graves to Cairo (1943), starring Franchot Tone, Anne Baxter, and Erich von Stroheim. 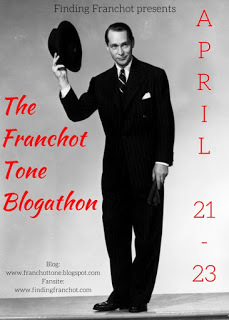 This article is part of The Franchot Tone Blogathon hosted by Finding Franchot. Old Hollywood leading man Franchot Tone had one of his best roles in the World War II action-adventure film Five Graves to Cairo (1943) as a British officer who gets entangled with legendary German general Erwin Rommel (Erich von Stroheim). Five Graves to Cairo begins when Corporal John Bramble (Tone) gets separated from the rest of his tank crew in the North African desert. The delirious Bramble walks through the desert for several days before stumbling upon an isolated hotel that is run by the sympathetic Farid (Akim Tamiroff), who agrees to hide Bramble from the oncoming Germans. However, when Rommel and his staff decide to spend the night at the hotel, Bramble must go undercover as a waiter, where he learns a valuable secret about the German supply lines. Five Graves to Cairo is based on the play Hotel Imperial by Romanian writer Lajos Biro. Originally set in World War I, it had already been filmed twice -- a 1927 silent film starred James Hall and a 1939 remake starred Ray Milland. Director Billy Wilder, who found the script in the Paramount Pictures' vaults, decided that he and writing partner Charles Brackett could successfully update Biro's spy thriller to include Rommel, who had already earned the sobriquet, "The Desert Fox," for the exploits of his famed Afrika Korps tank division. Von Stroheim eagerly signed up to play Rommel, but Wilder had some trouble filling out the rest of the cast. 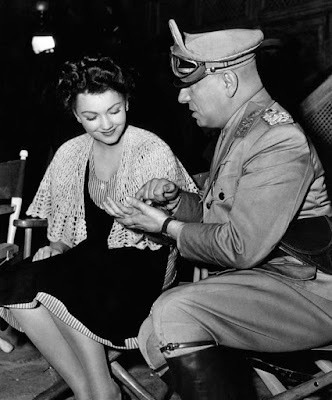 Ingrid Bergman was Wilder's first choice for the role of the self-sacrificing French maid Mouche, but independent producer David O.Selznick, who had the Swedish star under an exclusive contract, would not loan her out to Paramount for Five Graves to Cairo. Instead, newcomer Anne Baxter earned rave reviews in what became her breakthrough role. Wilder initially wanted Cary Grant for the role of Bramble, but when he repeatedly turned the part down, the director turned to Tone, who gives one of his most memorable screen performances of the 1940s. The film, with its ripped from the headlines appeal -- American newspapers in 1943 would have been filled with stories of Rommel's exploits -- was a hit that earned rave reviews from critics, who mostly focused on Wilder and Brackett's witty script and von Stroheim's flamboyant performance as the field marshal ("Boy, what a nasty Hun," critic Bosley Crowther enthused in his The New York Times review). 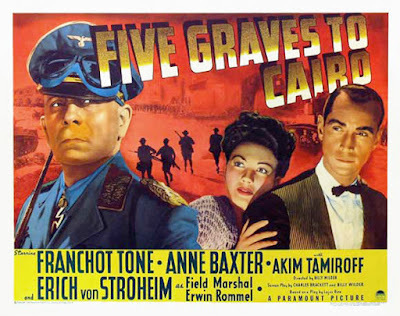 Viewed today, Five Graves to Cairo is still first-class entertainment. The film is not only anchored by von Stroheim's masterful performance as Rommel -- his arrogance practically oozes off the screen -- but also by great supporting work from Baxter and especially Tamiroff, as the comically flustered hotelier who edges closer to a nervous breakdown as events spiral out of his control. Erich von Stroheim reads Anne Baxter's palm on the set of Five Graves to Cairo (1943). The film also gives Tone, an alumnus of the avant-garde Group Theatre in New York, the chance to really show off his acting chops. Tone's good looks and amiable demeanor often led him to be cast as a love interest (see Dancing Lady and Dangerous) or as a second lead in historical pageants (see Mutiny on the Bounty) that didn't always take advantage of his considerable acting range (Tone would eventually develop into a much sought-after character actor in films like Advise and Consent (1962) and TV shows like "The Silence" episode of The Twilight Zone). Five Graves to Cairo allows Tone to play a dashing action hero, but he also has to masquerade as a disabled hotel waiter who also happens to be a Nazi spy. Tone effortlessly switches personas throughout the film: One moment he is romancing Mouche, while the next he is limping through the hotel corridors trying to obtain crucial secrets about the German supply lines from the wily Rommel. 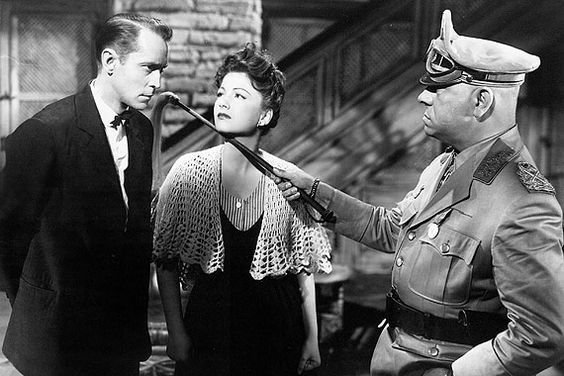 Five Graves to Cairo will air at 12:15 p.m. April 29 on TCM. It is also available on DVD and video on demand. This film is so good! I didn't know Cary Grant was Wilder's first option - because Tone gives a very good performance. I also watched 1927's Hotel Imperial, focused more on Pola Negri playing the maid. Well, each decade with its focus, right? Very god review, as always. Kisses! I've never seen either of the other versions. I'll have to check out the silent version; Pola Negri is an underrated actress. Love this movie. It is even the Treasure of the Week on my site. Looking forward to seeing it again on the 29th. Thank you for adding it to The Classic Movie Marathon link party. I appreciate it. I saw that on your site and I hope people take the opportunity to check it out. It's an underrated Wilder film. Just watched this excellent movie, as it was on TCM again. Had kept your review, as I had seen it some time ago and wanted to rewatch it. Your review is excellent! I didn't realize it was a breakthrough role for Baxter. You didn't mention Peter van Eyck as Lt. Schlegel. I thought his performance was excellent. His biography on IMDB is very interesting.